Dr. Donald V. Weatherman, president of Lyon College since 2009, announced his retirement during the Board of Trustees meeting on Friday, October 23. He plans to leave at the end of the 2016-17 academic year and made the announcement now so that the College will have ample time to find his successor. Weatherman originally came to Arkansas College in 1983 as the John D. Trimble, Sr., Professor of Political Philosophy but left in 1999 to become Vice President and Dean at Erskine College in Due West, South Carolina. In 2003, he became Executive Vice President and Dean of the College there. When Dr. Walter Roettger retired from Lyon in 2009, Weatherman was the choice of the search committee seeking a replacement. Bruce Alton, an executive search consultant working with the committee, noted that it was the only time in his career that a single candidate had been the top choice of every member of a search committee. Weatherman holds a bachelor’s degree from California State University at Los Angeles and a Master of Arts and Ph.D. from Claremont Graduate University in Claremont, California. He taught at California State University, San Bernardino before moving with his wife, Lynn, to Idaho, where he taught for three years at the College of Idaho, a small, private liberal arts college, winning recognition for excellence in teaching. “We discovered when we moved there that we like having seasons. Then we moved to Minnesota and discovered not all seasons are created equal,” Weatherman joked. He taught in St. Paul at the College of St. Catherine, another liberal arts school, for five years, where he was recognized as Teacher of the Year. Seeking relief from the brutal winters, Weatherman said his in-laws, who planned to retire in Mountain Home, urged the couple to consider moving to Arkansas. As an Arkansas College professor, he received the Lamar Williamson Prize for Excellence in Teaching in 1986. Weatherman began the College’s philosophy and politics programs, established the faculty and staff assemblies, and co-chaired the first strategic planning effort. In 1988, he spent six months in Washington, D.C., as one of the first Bradley Resident Scholars at the Heritage Foundation. During his first employment at Lyon, Weatherman wrote a weekly column for the Batesville Daily Guard and then for the Arkansas Democrat-Gazette. He is the author of a book, Endangered Guardians: Party Reform Within A Constitutional System, along with numerous professional articles, editorials, and reviews. Since his return to Lyon as president, he has served as a Board member of the TranSouth Athletic Conference, the Midwest Athletic Conference, and the Association of Presbyterian Colleges and Universities. 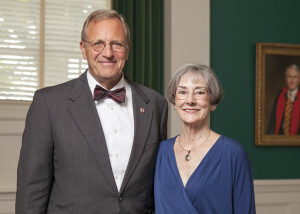 He has also been a member of Arkansas’ Independent Colleges and Universities and currently serves as Chairman of the Board of the group’s Presidents’ Council. In the community he is Co-chair of the Independence County Strategic Planning Committee and a member of the FutureFuel Chemical Company Community Advisory Panel, Chief Executive Officers Organization of Batesville, White River Health System Board of Directors, and the White River Medical Center Advisory Board. He is also on the Board of the Philadelphia Society, a membership organization of scholars, educators, journalists, business and professional leaders, and clergy who explore pressing economic, political, cultural and other issues and provide analysis that influences the ongoing debate about the future of freedom in the U.S. and around the world. Weatherman and his wife celebrated 42 years of marriage last April. They have two children, David and Andrea. David is an attorney and lives in Nashville with his wife, Kristine Fox, and their two children. Andrea is completing a Ph.D. in German at Vanderbilt University.